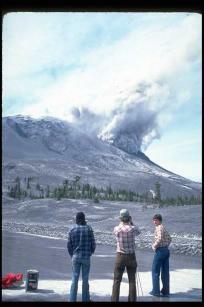 At Mount St. Helens a month before it experienced a catastrophic eruption. Source: NASA Roundup, May 2, 1980. 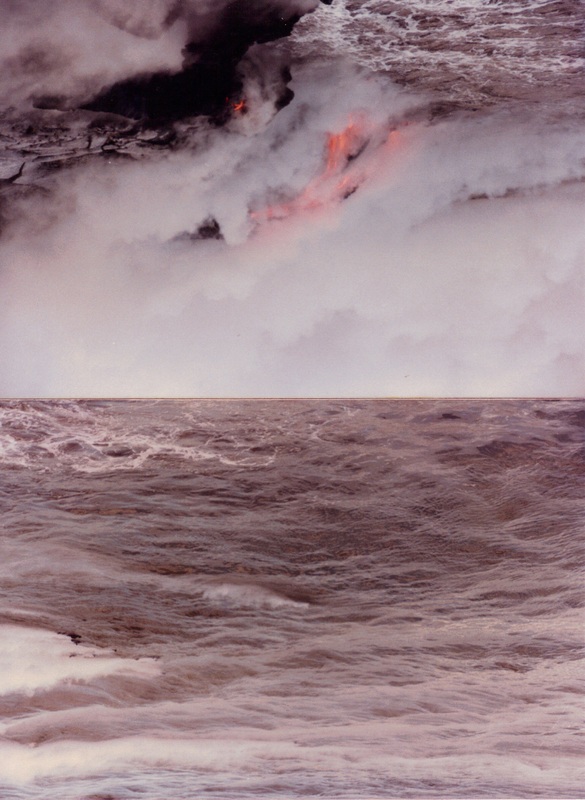 For those of us who will never be astronauts, seeing an erupting volcano is the analog of what it must be like to visit a planet that is in one of its earliest stages of evolution. It is an experience like no other. Of course, it is not always possible to view volcanoes in eruption so I have found it worthwhile to visit as many volcanoes as I could in the hopes that I might find tell tale signs of activity: smoke, ash, or lava emission. One of the most active and dangerous volcanoes in the area, I first visited the area in 1983 but did not notice this cone. 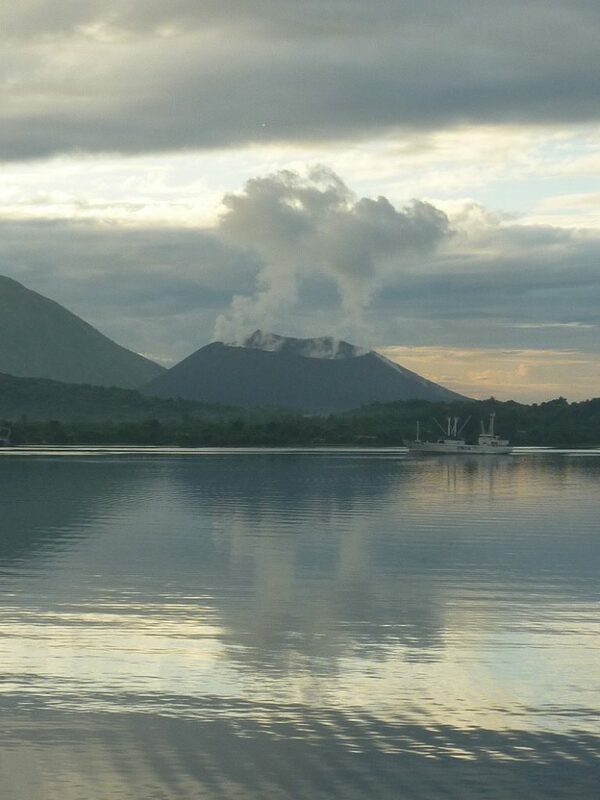 On our sail into Rabaul this time it was quite noticeable with constant steam emissions and ejecta rolling down the right side as seen in the above image that I shot. On the day we climbed the volcano, there was constant steaming, but no earthquakes or ash plumes. We were the only people around. 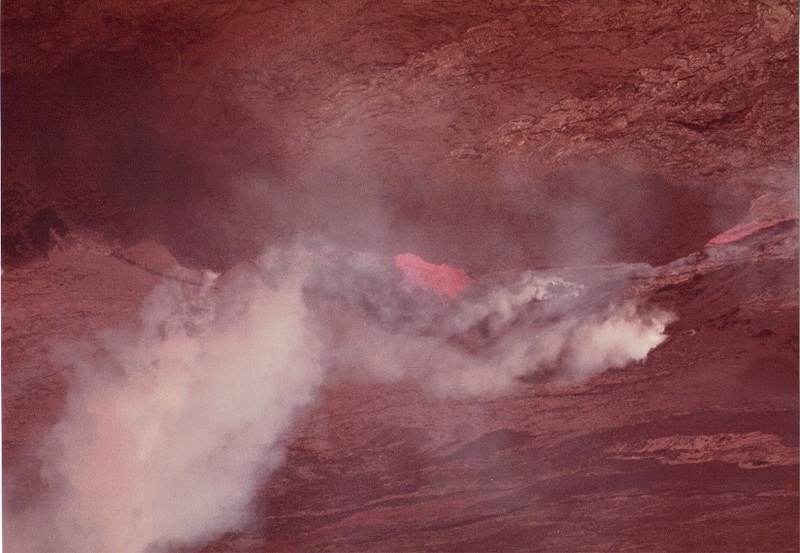 The reddish lava flow can be seen from the 2012 eruption on the left side of the image. A landslide and eruption in December 2018 created a tsunami in which killed hundreds of people on Java. Volcanoes can be incredibly dangerous yet fascinating at the same time. Soufriere Volcano on December 3, 2012 as photographed from the Sea Dream I near sunset. P.Maley photo. 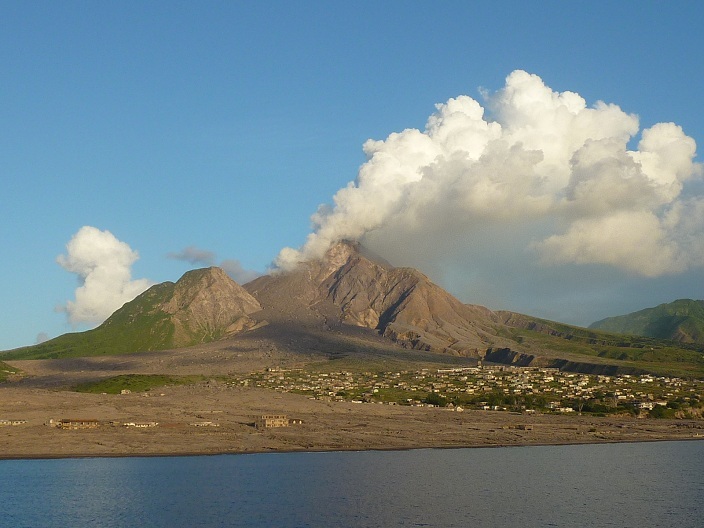 Spectacular views of Soufriere can be had from air and sea. 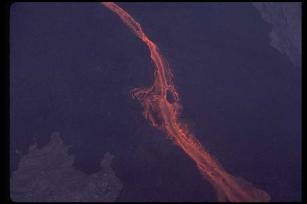 Lava flows have swallowed much of Plymouth town (above) and much of the area is still unsafe for entry. At the Montserrat Volcano Observatory with a view to the west in early afternoon. There are fumaroles visible from this side. 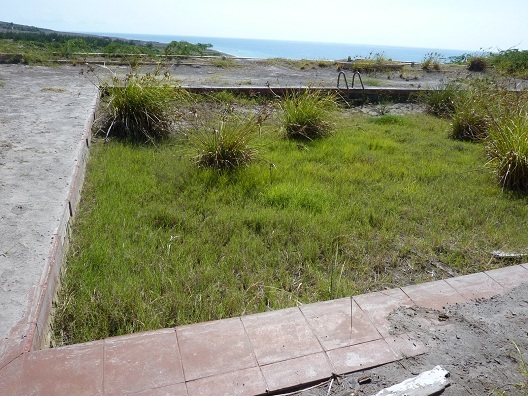 A swimming pool (above) filled with volcanic ash from Soufriere. 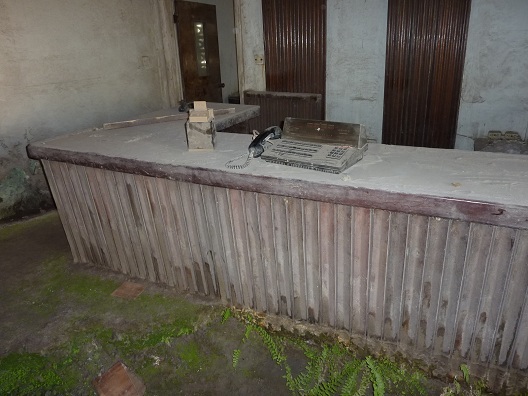 The interior lobby (above) of a Plymouth, Montserrat Hotel 17 years after the initial eruption which caused the destruction of the town. Following the Transit of the planet Venus across the sun on June 8, we traveled to Reunion Island to climb Piton de la Fournaise. Driving to the Pas de Bellecombe, we hiked 2 hours to Crater Borey where we observed lava flows from the September 2003 eruption and emissions from the area of the May 2004 eruption. Excellent weather prevailed in early June and temperature ranged at the 2500 m elevation in the morning from 65 to 75 but wind chill made it colder at times. 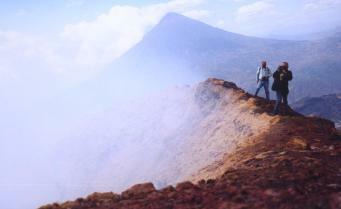 We began to hike down to the caldera at 9:00am reaching Borey Crater at 11:20am. We returned back to Pas de Bellecombe by 1:15pm after spending about 20 minutes at Borey checking out the area. There was no action at this time. 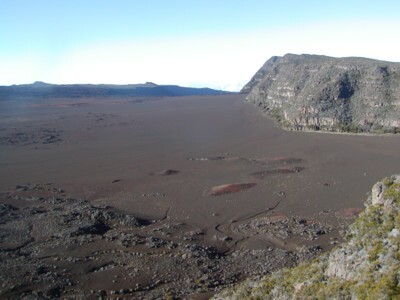 Piton de Neiges and the Crater Commerson are encountered first. 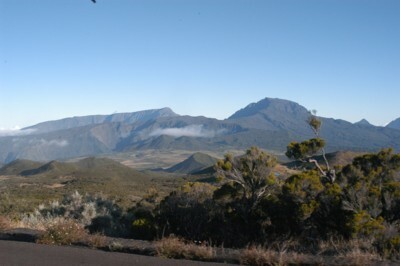 The first good panorama on the way to Piton de la Fournaise. The light changes and in midday you can see different coloration. From Pas de Bellecombe you have to climb down 150m elevation to get to the caldera base. The surface is pahoehoe. Looking upward from the caldera floor you have to hike an elevation of 500m. 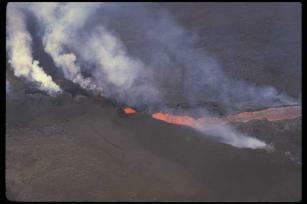 A lava tube is in the lower part of the photo. Note the little white dots which are other hikers. Take a rest on the lava flows. Wear good shoes and be ready for changes in temperature and wind status at any time. A good hat is a must to prevent sunburn. Lynn Palmer (left), our guide Alexa (center), David Callendar (right). I finally reached the 2600m lip of Borey Crater and there was a steady stream of hikers following me. The area is remarkably free of litter. But you need to keep hydrated. The hike up is difficult by we also saw small children and a dog that were making the trek. There does not appear to be any semblance of security or emergency services much less surveillance in the area. Island volcanoes are amongst the more interesting to reach. This one, located 29 miles north of the coast of North Island is privately owned and reachable by tour operators using boats or helicopters as a regular tourist attraction. I traveled here following the total solar eclipse of November 23, 2003 that I witnessed from a Boeing 747 while flying over Antarctica. 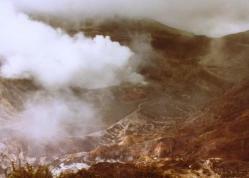 The weather over White Island was perfect but activity was limited to mild steam venting. 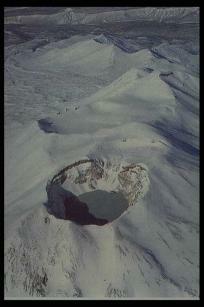 The crater itself is located just below sea level. We spent about 2 hours on the island and the walk itself is generally short and impressive. 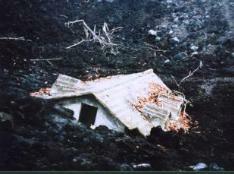 The ruins of a small factory are located adjacent to the crater area having been destroyed years ago following eruptions. Standing on the edge of the crater it is sometimes necessary to don a gas mask. A wide angle view of the island with 2 helicopters in foreground. On the day I visited, there are two large sulfur vents with high gas output. 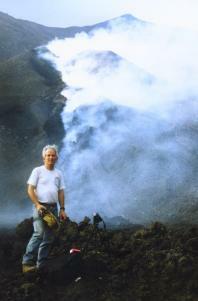 I made two trips to Etna in 2001. 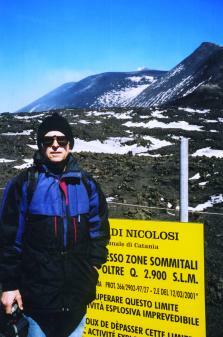 The first was to visit the Astrophysical Observatory near the top of Etna. It was snowing the first day. On the second day the weather cleared and we took the cable car to the closest point where we then took a four wheel drive vehicle. At the 2900 m level this photo was shot. Just a bit of steam from the two main craters that we could see from this south side view. At this level we were actually above the clouds. Coming down later in the day, the clouds enveloped the trail and we were lucky to find our way down to the cable car station. On the road up the mountain you can see the remains of a house that was enveloped in lava. In July, I heard about a large scale eruption while in Moscow. 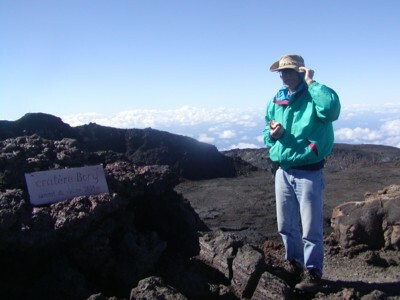 I could not travel to Etna until nearly 2 weeks later using frequent flier mileson Delta Airlines. By this time the eruption was nearly over. However, I met my colleague Antonio Frasca and together we drove at night through the police barricades to the east side of Refugio Sapienza. The following pictures were some of those taken. 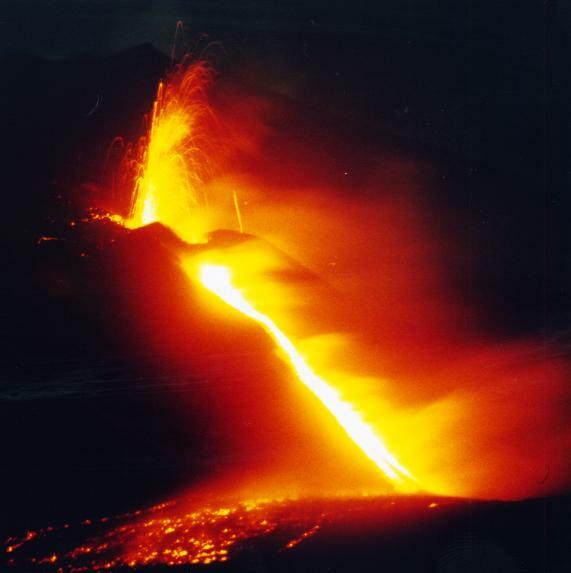 This photo was shot August 7, 2001 by a Dutch tourist who had hiked to this point at the base of a lava flow. I saw ‘steam devils’ being whipped around by the stron winds. The lava was very slowly rolling down the hill. We were chased off by the carabinieri for getting too close. A small, loud, spectacular explosion from a an eruptive cone occurs during this 30 second exposure on ASA 400 film. You need a flashlight in order to safely hike up the adjacent terrain at night. Luckily the temperature was around 65 degrees F. On our previous trip it wasfreezing! 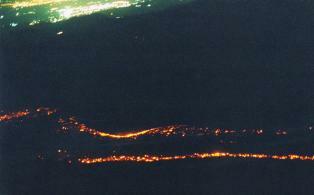 You can see the lights of the city of Catania on the coast below as lava flows down from the 2900 m elevation point. If you get close enough to the flow you can actually hear ‘bacon sizzling’. This is the true sound of this form of lava slowly inching its way along the surface. You can approach generally to within about 5 meters beforethe heat gets to you. Be sure to wear good hiking shoes or else your soles may melt. Its always a good idea to bring water, a hat and sunscreen and above all to use common sense. 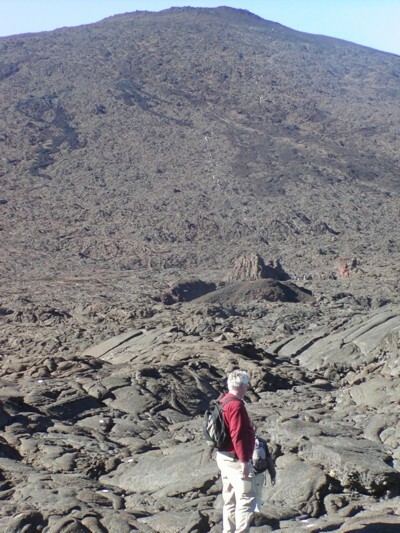 Though normal tours resumed a day after this shot was taken, it is easy to injure one’sself by hiking in shorts, without gloves, and moving to rapidly on the very sharp lava flows. There is no medical aid close by and you couldbleed to death if you walk alone and are careless. In addition it is always a good idea to heed the signs warning of areas that are dangerous. Lynn and I flew to Guatemala City and met Don Alfredo MacKennie. The three of us hiked to the top. 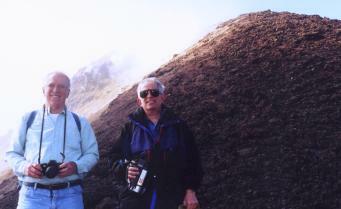 The first photo shows Agua volcano in the background while Don Alfredo and I are standing on Pacaya. 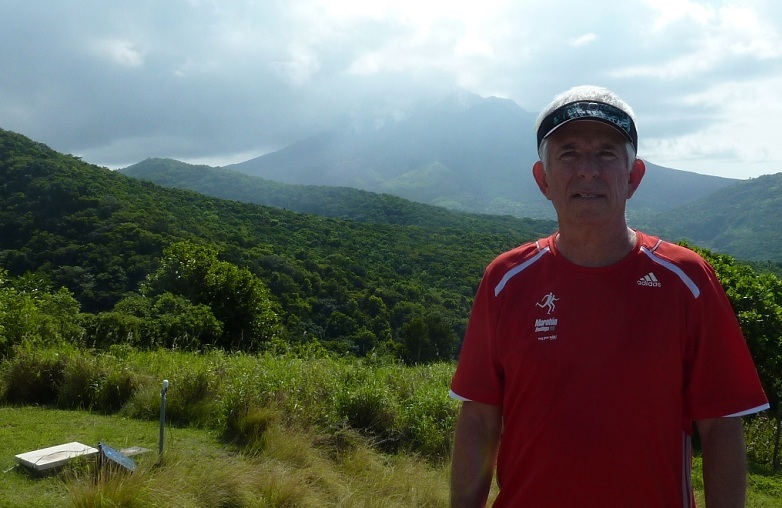 This was his 995th trip up the volcano and my first. Its a tough walk but in February the skies are generally clear. We had to pay a fee to get past machete-wielding residents who erected a toll gate along the only trail up the volcano. Wind was blowing from the northeast and we walked up the east side. 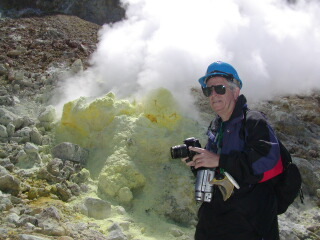 Upon reaching the rim I was nearly knocked over bythe noxious sulfur gases that would occasionally be swept out of the crater. You have to be quite careful not to slip and fall down the steep incline of the cone. The surface is pebbly and your feet give out under you as you walk on the crushed volcanic rocks. It took about 3 hours to make the climb. But getting down is a snap as it can be less than a 20 minute ‘slide’. Photos of myself and Dr. MacKennie shot by Lynn Palmer. 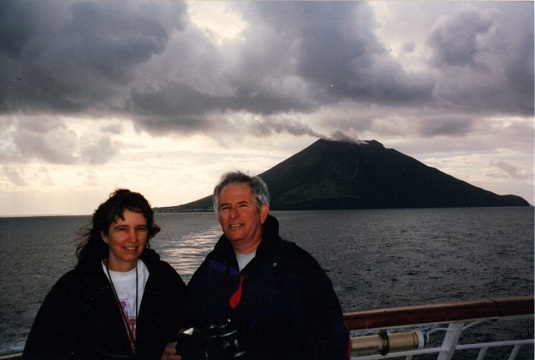 While on a Mediterranean cruise we passed by Stromboli. I provided a narration for the crew and passengers on deck during the sail-by. In November 1994 we travelled to Tacna, Peru to observe a total eclipse of the sun. Afterward, on our way back to Lima, Peru by plane, I was able to get the Aeroperu Boeing 737 pilot to circle the volcano so we could get a good look into the crater. These pictures were shot by Michael Schramm. Sabancaya is time consuming to reach by land, henceflying over it is a good way to see the crater. 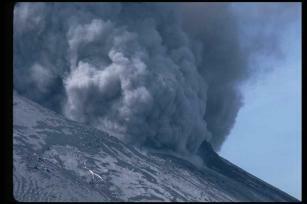 I went to Mexico, not to see Colima volcano, but a reported weird phenomena. This was reputed to be a gravitational anomaly affecting cars whose gears are placed in neutral on a road that appears to tilt downward. The car moves up the road seemingly to defy the laws of gravity. 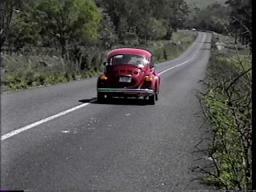 To try this out, I flew to Manzanillo, Mexico, and drove to Colima renting a small Volkswagen. We found the road which is reputed to be the source of this odd phenomenon. Using a level, I was able to ascertain that the road appeared indeed to slope downward. 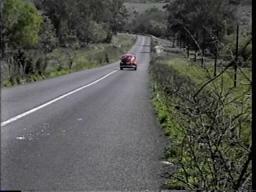 The two photos that follow show first the car where I placed the gear in neutral at the bottom of the hill. In the second image, the car actually proceeds to move (backwards) up the hill. Afterward, I drove to the large city of Colima. The volcano by thesame name towers to its north. I drove up the west side about 6 miles from the summit and shot some video, a frame of which is reproduced here. 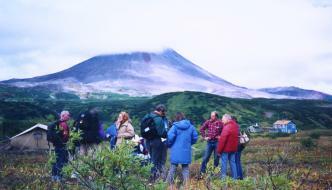 I led a group on a unique trip to the Kamchatka peninsula to conduct joint work with the Institute of Volcanology in Petropavlovsk. We flewby helicopter past a number of spectacular volcanic peaks and camped for a week at the base of Karymskii where we aided in magnetometer studies around the volcano. In the middle of August it snowed; we were constantly dodging hordes of angry mosquitoes, and because there areno roads at all in Kamchatka, normal travel everywhere is by helicopter. Kamchatka has numerous active volcanoes and one of the four largest geyser fields in the world which we flew over. If you ever fly on a Russian helicopter, be sure to bring ear plugs. Our campsite at the base of Karymskii volcano. The next few pictures are views from a helicopter. 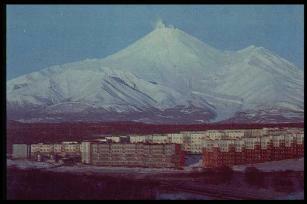 The last photo is Avachinskii volcano which towers over the town of Petropavlovsk-Kamchatskii, a naval base and jump off point for volcano watching. On a second trip to Hawaii I photographed lava entering the sea and a pumice raft (images below). 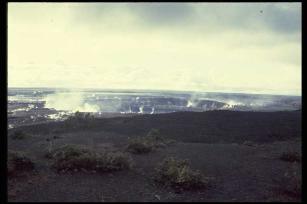 The above photo is a view of the rim of Kilauea. The rest are photos I shot from the helicopter while flying over Mauna Loa. 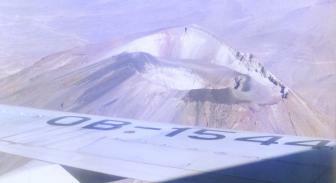 Landing near an active spatter cone, I shot this photo while with a team of geologists. 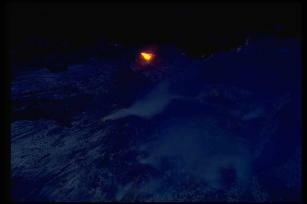 Flying directly over one of the lava channels in the helicopter, I was able to grab this shot above. 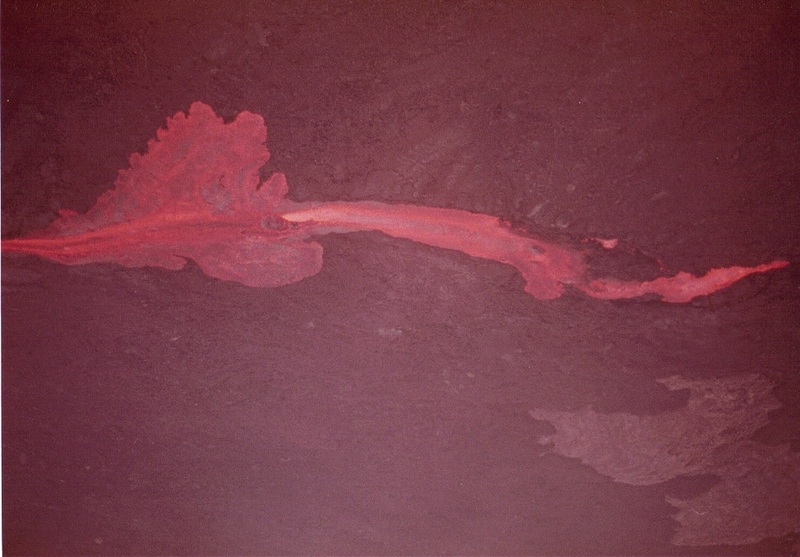 Lava and steam at the edge of a crater. 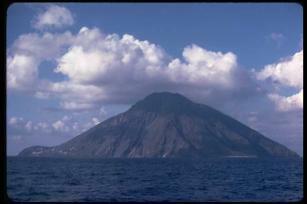 This very interesting tourist volcano is in the Aeolian Islands justnorth of Sicily. 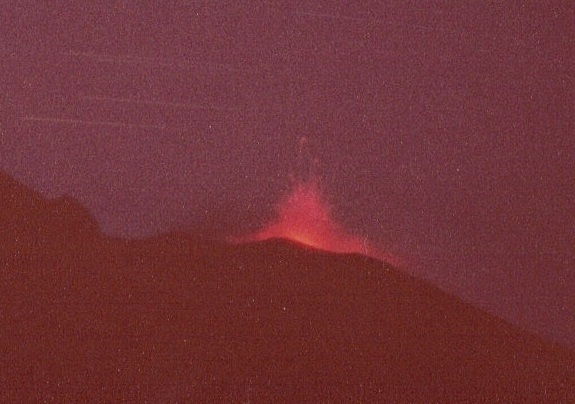 I traveled here in 1983 and spent one night watching the eruptive activity from afar. The next morning I hiked nearly to the top. Since that time I met Pierluigi Ascari on an eclipse in Gabon in 1987. He has a house on the island and from there is able to keep aneye on the volcano which has been in a constant state of eruption for around 2000 years. Also known as the Lighthouse of the Mediterranean, Stromboli is also the name of a movie and a type of American pizza.Stromboli is a quaint, small island and the volcano is a rather difficult climb if you are not in shape. However, the nightly fireworks are low level and you need to climb to the top in order to get the best views. Approaching Stromboli on a hydrofoil it was possible to get this shot. Timed exposure about 2 km away of indandescence on a summer night. 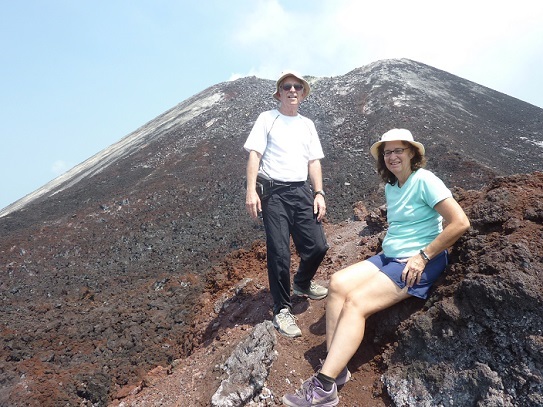 Hiking up the volcano, it is possible to get close to ash eruptions and to feel tremors. Best hikes are early in the morning or late in the afternoon. It is too hot normally in summer to hike in midday.The best weather time to visit Stromboli is June-August, but that is when the most tourists arrive and accommodations can be full up. Getting to the island is not easy and you have to allow at least 2 days to get there and back from the Italian mainland. I plan to go back. 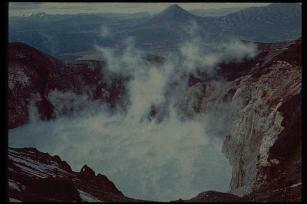 Just steam was visible rising from the caldera. But the lake was very sulfuric in appearance and visibility was generally poor there all the time. 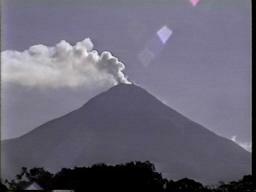 I had traveled here to see Arenal volcano which had begun erupting again in 1968. Unfortunately, I drove for hours over unmarked roads trying to navigate through Costa Rica to find Arenal without success. This will be rectified later in 2001. 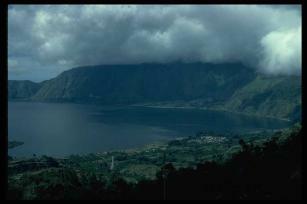 One of my first adventures was to the Indonesian island of Java for the total solar eclipse of June 1983. 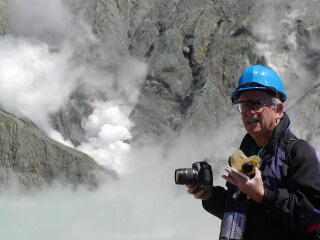 There I arranged to visit the active volcano Bromo which entailed all night travel: first by vehicle,then by horesback until we eventually reached the crater area before dawn. 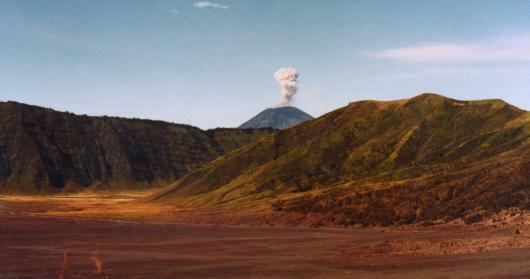 Bromo is set amidst a large caldera. To see the crater itself you must ascend numerous hewn steps until you finally make it up to the level where you can view inside. 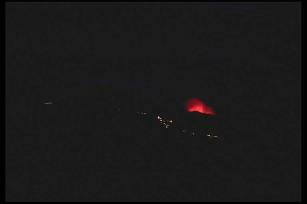 At the time I was there, a red lava glow could be seen in several places near the bottom. 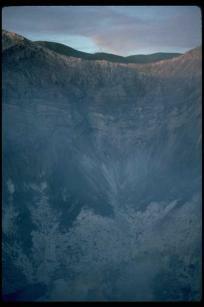 Peering into the crater before dawn you can see fumaroles and a small lava vent. 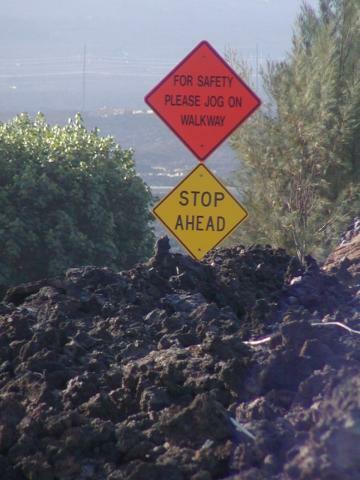 Hiking around a volcano is often very slow going. We spent a number of hours just walking about the Bromo crater. At one point I noticed what appeared to be a distant smoke column. On closer inspection itwas obvious it was an ash column. Every few minutes, a new burst of dark smoke would appear in the distant horizon. 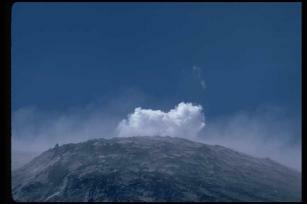 It was an eruption from the nearby volcano Semeru. 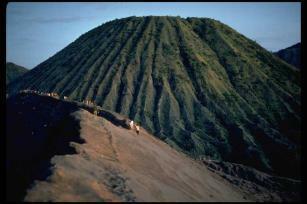 Indonesia is loaded with volcanoes! This was a trip I planned in conjunction with a trip to Australia. 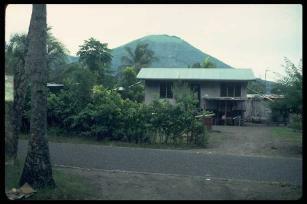 I was able to travel to Rabaul for 2 days. During this time I paddled a canoe to a volcanic cone across the harbor that years later eruption in the harbor. When we arrived at the volcano, it was surrounded by dense steamy jungle. 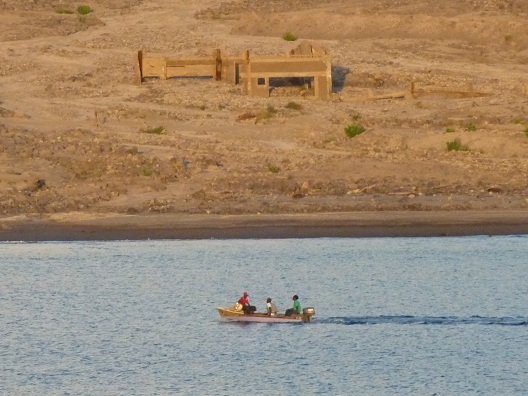 The canoe’s owner, a young boy, was able to scamper up the volcano. I labored to get to the top. 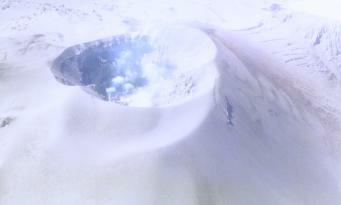 When I got there, I could look down into the crater and saw that locals had thrown garbage into it. 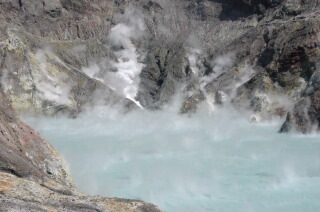 A hot spring was located on the shore and the volcano was not active when I visited. However, that night, a very strong tremor hit the town and it was scary. My guide owned a one-man tour company in Rabaul town and drove me to his father’s house. Here you can see the cone of a crater not far away. I was introduced to ‘shell money’ which is a currency actively traded on the island in addition to the official currency. 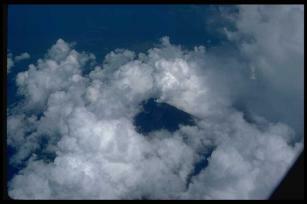 Flying over New Britain, here is another volcano that I recognized while headed toward Rabaul. 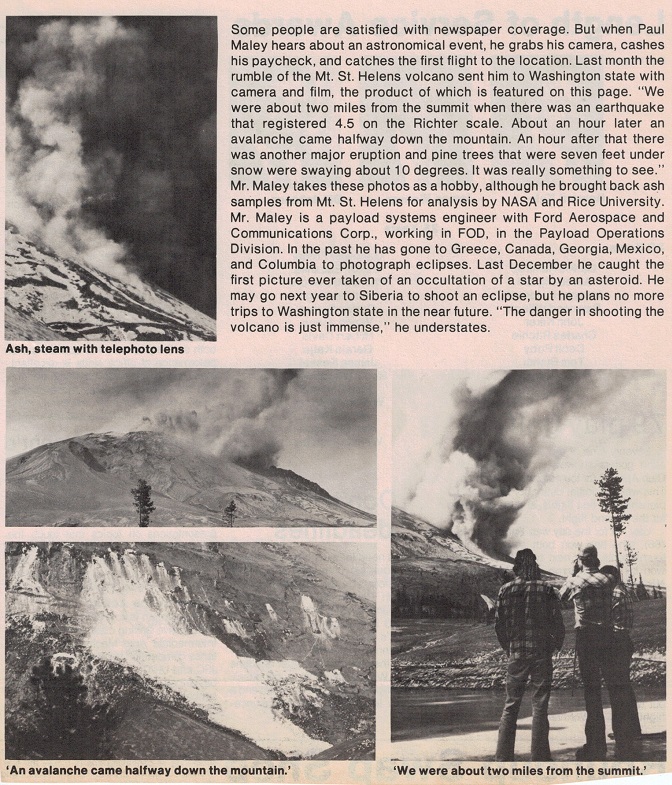 One month before the major eruption in May 1980, I traveled to Portland,Oregon and drove to the Mt. 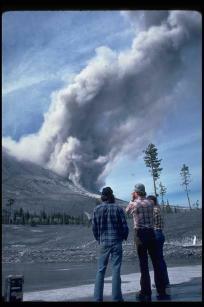 St. Helens volcano. Here are photos showing some of the activity as I was less than 2 miles from the bulge which later was the source of the collapse and violent explosion. A large earthquake occurred while I was there and 100 foot tall trees could be seen swaying back and forth. A landslide sent part of the mountain tumbling down. Only a few people were in the Red Zone besides myself and the frequent ash, steam eruptions were a sight to behold. Standing on the northeast side of the mountain, I could see frequent explosions of steam/ash which would send small pyroclastic flows down the north side. 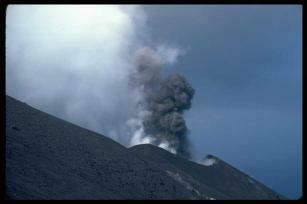 Close up of the pyroclastic flow. 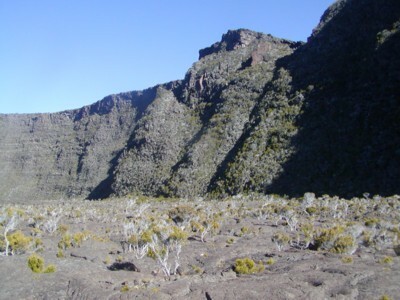 The growing section on the north side of the volcano whose collapse led to the cataclysmic explosion.